Nacional Trekking Festival - El Chaltén, Patagonia, Argentina. 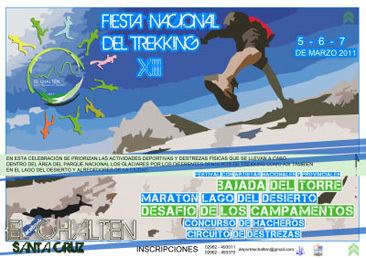 The city of El Chaltén is prepared every March for a new edition of the National Trekking Festival, an event that brings athletic and cultural events. In 2011 was held from 5 to 7 March and mountain races, the challenge of shelter and Lake Desert marathon in 42 and 21 kilometers were made. The Festival commemorates the Argentine first attempt to conquer Mount Fitz Roy, on March 18, 1948. In addition, El Chaltén has been named as the "Provincial Capital of the Trekking" in 1993 and this is the place for the holiday. In each edition is expected the presence of visitors and competitors from Argentina and neighboring countries to the sports events more conveners: Trekkatón Race and the Shelters Challenge. In this celebration are prioritized outdoor activities, sports practices and phisical skills that are carried out within the area of Los ​​Glaciares National Park by the various hiking trails and around the city. There are also recreational activities and Top Rop climbing for all age groups safely in the vicinity of the Sports Ground Stable. Loggers competition is performed and you can enjoy the Artisan Stroll in the sports community center, in the evenings of tango shows, Latin American folklore and the election of national trekking queen. Also it will be conducting the "Descent of the Torre" which consists of 11 kilometers of mountain trails with a vertical drop of 200 meters. Most travel is down but it contains some hills. Shelters Challenge is an endurance type cross country including zip line drawn on the Fitz Roy River. The stone needles of Fitz Roy, a challenge for climbers Mount Fitz Roy is a part, as the Perito Moreno glacier, in Los Glaciares National Park in the south of Patagonia. To reach it you have to go to El Chaltén, located at its feet and at few kilometers from the border with Chile. Things to do in El Chaltén El Chaltén is the trekking capital of Patagonia. An ideal place for hiking the trails of little difficulty or, for the more adventurous, the challenge of ascending to Torre Hill and to the imposing Fitz Roy. A weekend in El Chaltén El Chalten offers tranquility and magnificent scenery to explore and photograph Patagonia. The city is ideal for those who enjoy mountaineering, hiking, bird watching and biking, among others things..